One of the more vexing challenges for those in the energy efficiency program sector is ensuring that savings resulting from the implementation of an efficiency measure persist over time. Fortunately, a solution exists: intelligent efficiency can prevent the degradation of energy savings, and in some instances increase savings over time. Imagine you’re a building operator with a complex building management system. You’ve become accustomed to the decline in energy savings that often occurs in the months and years following the implementation of an energy efficiency measure. As time goes by, the tenants in your building change, old walls come down, and new walls go up. The ductwork on a floor that supplied air to one large room now supplies air to several smaller ones. The programming that once optimized energy use has been turned off or overridden. Your tenants all keep different hours, have different equipment, and hold different expectations of the building. Without changes to the design and controls of the lighting, heating, cooling, and hot water systems, to adapt to these changes, one or more of the systems may operate against the interests of the tenants. Perhaps they suffer with it for a while, but ultimately they begin to adjust thermostats and install work-arounds such as closing off air supply vents, overriding programs on programmable thermostats, and opening windows. These changes induce a response from the system that exacerbate the situation. A negative feedback loop is created that moves the system further away optimal energy use. Now, look at the figure, and assume a new energy efficiency measure has been installed in your building. Say, a programmable thermostat. The initial change in energy use and its subsequent increase is captured in the first part. When first programmed, the thermostat is likely to reduce energy use, because it enables the user to reduce the level of cooling or heating during hours when a building is not occupied. But this level of savings is likely to be lost once the needs of the building change, because rather than reprogram the thermostat, operators are likely to bypass the programming and set the temperature manually. The energy use that had been going down now trends back up and savings degrade. The energy use may not return to pre-implementation levels because some energy measures are more sustainable than others. New, more efficient lighting will, more often than not, permanently reduce the energy use of a building, regardless of hours of operation. Also captured in the figure is the common experience of a building receiving occasional upgrades. With each upgrade, energy consumption falls. And then, over time, savings degrade as devices drift out of spec, building needs change, and programming is overridden. A new project is implemented and the trend continues. To address this issue and to realize greater savings, homeowners, building operators, and program administrators are turning to more advanced building management systems. Reducing or eliminating the degradation of savings is not only important to building operators, it is important to energy efficiency programs because the persistence of savings is key to meeting their savings targets and obligations. Savings degradation is a common issue in whole-building retrofit programs. To ensure the persistence of savings, programs are investing in learning thermostats for residential programs, and advanced building management systems for commercial programs, which utilize machine learning and historical building operating information to identify trends and optimal operating conditions. Data analytics enable these systems to not only maintain savings, but to actually increase them. They can also adapt to changing conditions and adjust equipment settings more quickly than human operators. The result is a building that is at or near optimal operating conditions a majority of the time. In the figure, we can see the difference in energy consumption between re-commissioning and continual optimization. 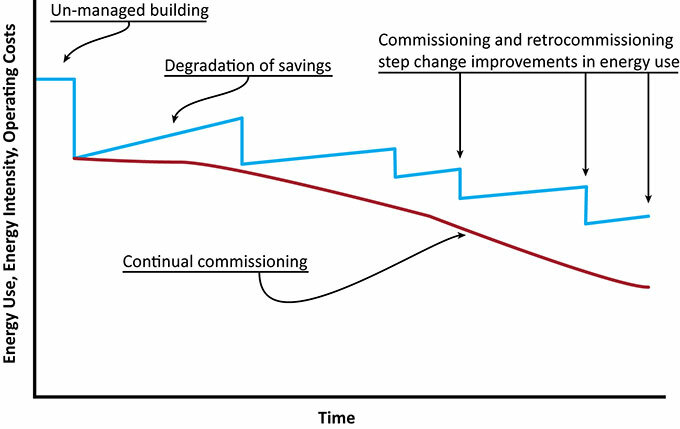 With re-commissioning, the periodic optimization of building systems is followed by degradation of savings and the need for repeated re-commissioning. With continual optimization, the savings increase over time as the control systems learn how to refine operations. The pattern captured in the figure is relevant to many other intelligent efficiency measures. Any compressed air, water, ventilation system, or industrial process can realize the same saving gains through continual optimization. The ability to capture energy savings that would normally be lost to degradation of savings is a key benefit of intelligent efficiency.